Every relationship starts with an introduction, and with Shuffle in your pocket, you’ll always have an engaging introduction readily on hand. Shuffle is the digital relationship manager that starts with a business card and capitalizes on the follow-up to help you build and grow your business. Make a memorable first impression the first time you share your digital business card, complete with the videos and content you choose to share. Never lose a lead again by easily and quickly following-up with your contacts through automated reminders. Keep track of those important interactions to make every engagement meaningful, and watch your business grow! 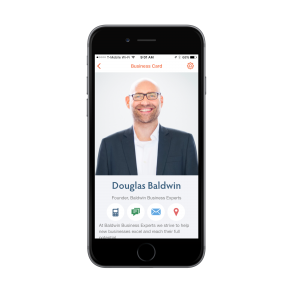 Create engaging digital business cards for every face of your business. Up to 10 per user! Quickly capture your prospects information and share your card. Enjoy the ease of follow-up reminders so your leads don’t run cold. Save contact notes so you always have the important details at your fingertips. Track your efforts with business card and campaign statistics on performance. Grow your income potential just by using and sharing the app through our generous affiliate program. Be the memorable first impression the people you meet will enjoy doing business with. Don’t get lost in the stack. Visit elifyshuffle.com to sign-up today!